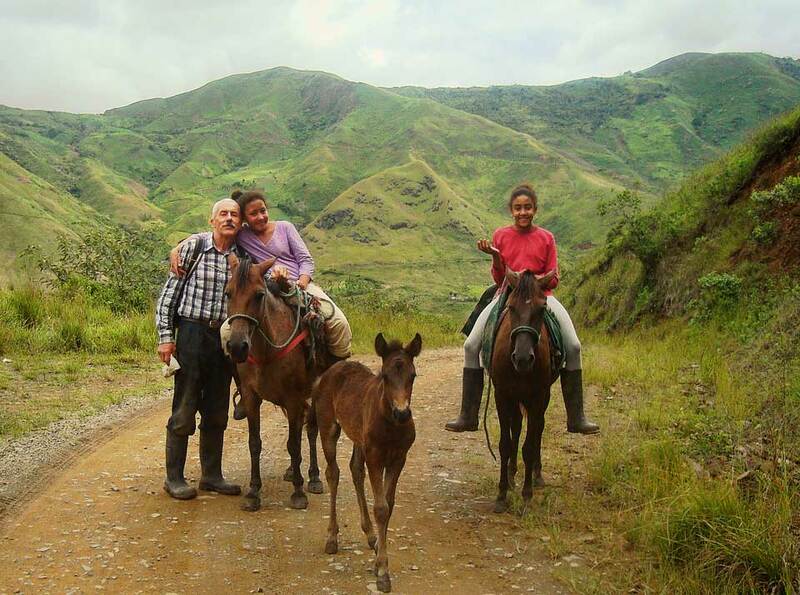 My name is Piet Sabbe, I am a Belgian citizen living in Ecuador since 1990. 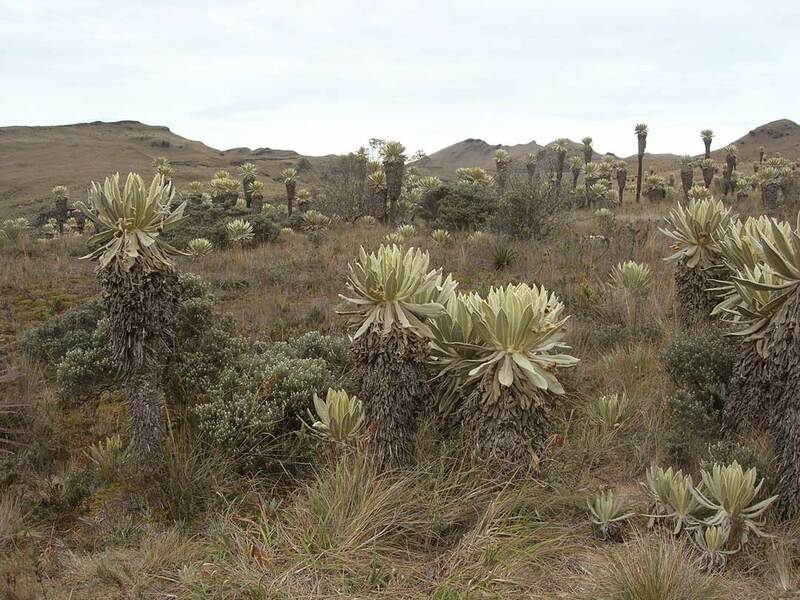 In 1995, I bought 15 hectares of degraded land, depleted of topsoil, on the Western slopes of the Andes in the North of the country. Parque Bambú is located in the valley of the Guallupe River, a small tributary of the main Mira River which flows from the Sierra to the Pacific Ocean. 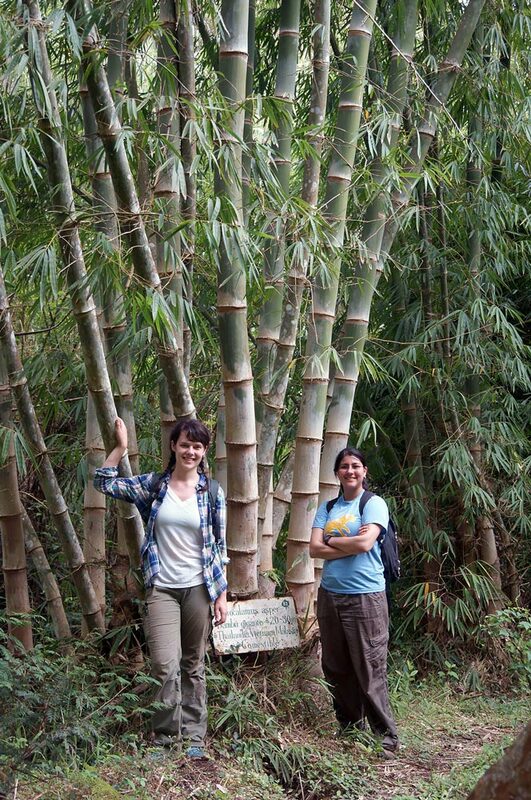 The original name of the property was Bosque de Paz (Peace Forest), but since Bosque and Paz are often related to graveyards in Ecuador (Bosque de Descanso, Jardín de Paz), I decided to call the property according to what most characterizes it: Bamboo (Bamboo Park – Parque Bambú). In October 2nd 1995, I planted the first tree. No one had dared to commit such a “rebellious act” in the previous 60 years, because the laws that regulated the land reform in the 1960´s required that all trees had to be cut down and replaced by crops in order to obtain the legal land titles. As a result of this near-sighted regulation the whole area had been deforested. Once covered with lush humid rainforest the hills are now barren, scarcely covered with stubbly grass. Till today local farmers hate trees – you can´t blame them. To make things worse, farmers set fire to the hills every year. As a young man, I travelled in the 1970´s to Israel, attracted by the slogan “We make the desert bloom” and hoped to take part in a heartwarming solidarity process to green the Negev wasteland. What I did find was a fraud; the Israelis are systematically harassing the Palestinians and robbing their land. Their disgust towards the Arabs is built into their educational system, considering them as sub-humans, to the point that this profound brainwashing makes them blind for the cruel repression that their leaders and military impose on the Palestinians. The situation is reminiscent of what happened to their Jewish ancestors in the years of war in Germany. Exit Israel. Years later I came to Ecuador to work as technical assistant in a Quichua bus coop. From the first day my interest was in the rugged but beautiful landscape of the Andes. Sadly, as result of the fast growing population and the tendency to “develop” even the remotest places in the country, pristine landscapes are destroyed, without any consideration of their intrinsic value or the environmental service they may provide for future generations. This time I was not confronted with a desert but with a landscape that needed help, focusing on a tiny little bit of landscape: my property. 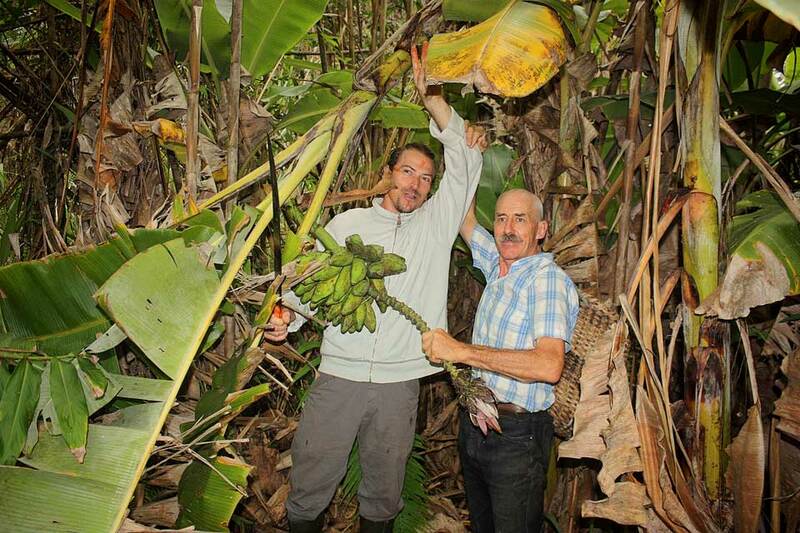 In two decades I managed to convert my 15 ha wasteland at the edge of the village of El Limonal into an oasis of green, containing many different species of trees, vines, bamboo and plots of cropland. 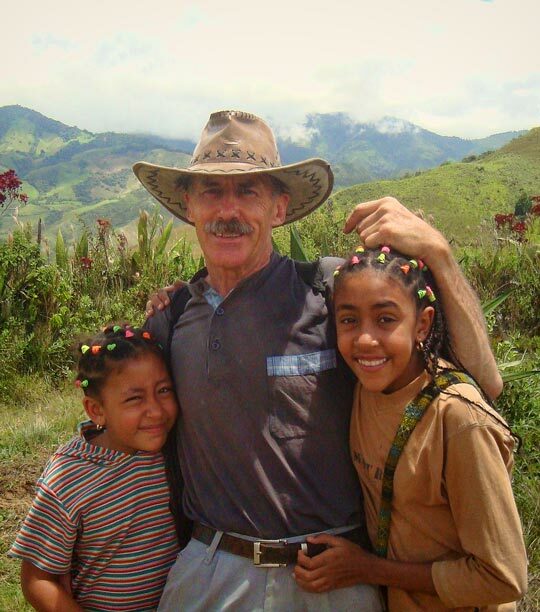 I offered my daughters an education connected with the land, an open space full of life, challenges and discoveries. But my wife didn´t appreciate all this. She had developed an absolute disdain for the frugal simple rural lifestyle. She dreamed of cable TV with flat screen, design furniture on a shiny tiled floor and the whole array of electro-gadgets that a wealthy family is supposed to possess. She divorced and took the daughters to the capital, where education is supposed to be much more decent. 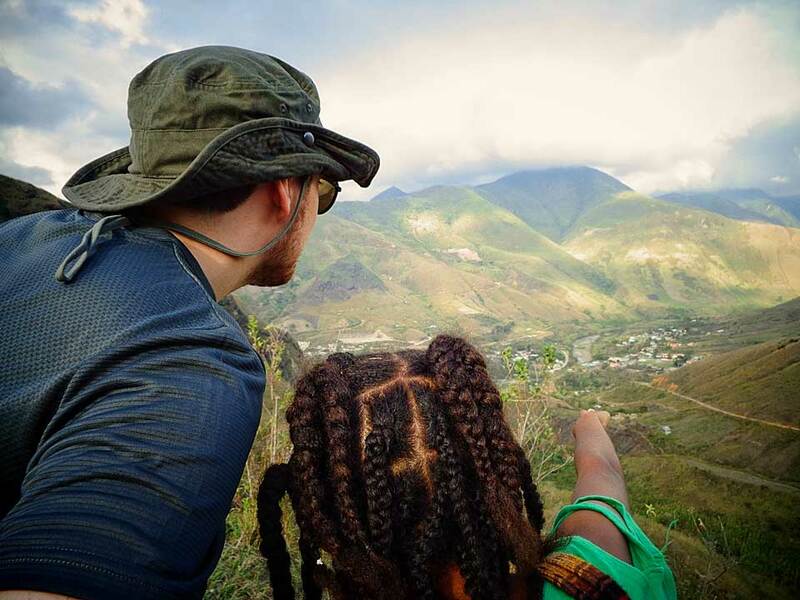 My passion to take care of the earth had grown much stronger, and with the need of change and transition in mind, I am convinced that my daughters – and so many other young people who left the land for similar and other reasons – will return and will have to learn to live off the land again. As a child I grew up in a densely populated part of Europe, in a quiet middle class town, at the time of the consumer boom in the fifties. Cycling the countryside, I saw beautiful landscapes converted into landfills, highways, supermarkets and industrial parks. The creeks where I used to fish stickleback with my brothers gradually got filled with motor oil, stinky matrasses and broken refrigerators. This was wrong and I felt that it had to be corrected, but how? I volunteered with organizations that protect the few natural areas that still existed in this dense web of concrete. My sleepy town got “modern” with the appearance of the first fashion shops, noisy entertainment events and trendy plastic shopping bags. In a couple of years’ time, all my friends knew more logos of cars and sound systems than the names of trees and plants that used to grow around the town. And this was just the beginning of our abundance and our alienation. 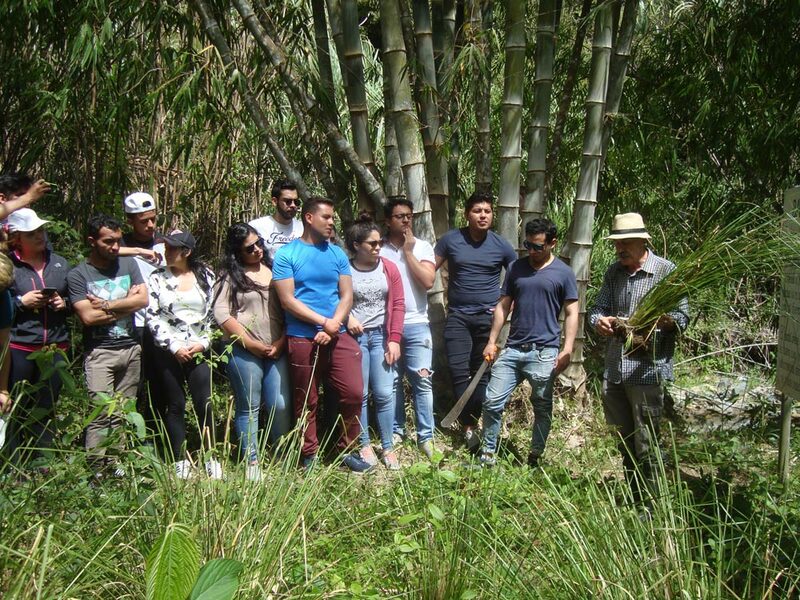 “About us” is about me and about all those people who have passed through Parque Bambú, as friends, visitors, apprentices, volunteers, researchers and tourists. And most of all, my local assistants who are hard working people. And hopefully one day my daughters. 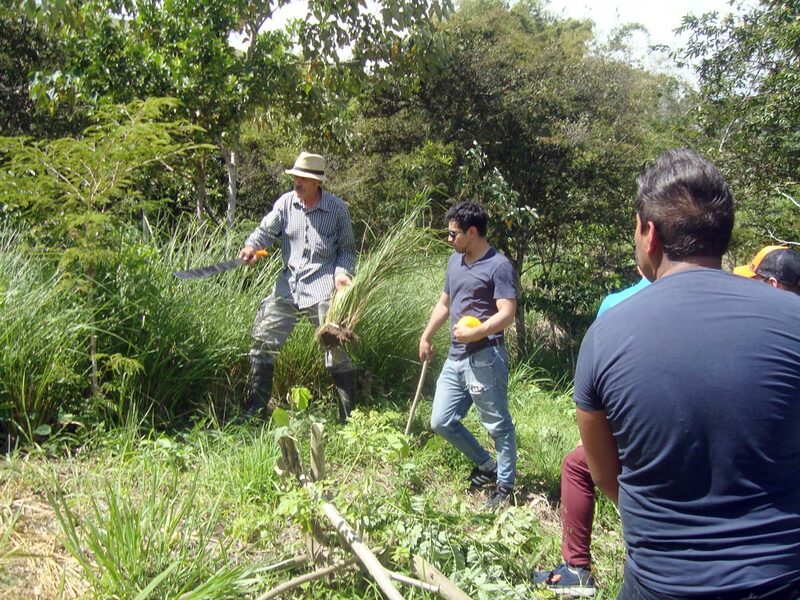 I invite you to become part of “about us” by planting some trees, by harvesting manioc and mango or by putting your skills and initiative at work in Parque Bambú and the surrounding hills. In the eighties a couple of old hippies mentioned me permaculture; they described enthusiastically the mandala circle, the herb spiral and the patterns of permaculture. All this surrounded by the scent of patchouli and hash, they were dressed in orange fluttering attires, copied from some enlightened Indian Guru. 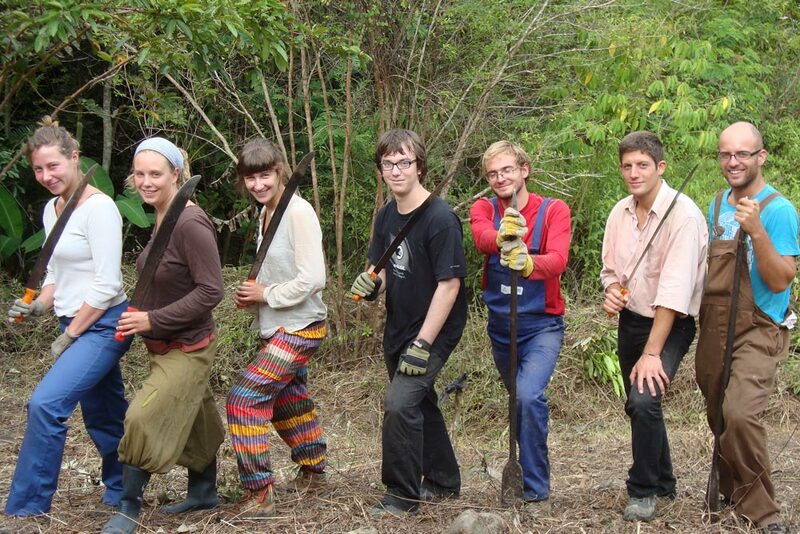 I dismissed these Flower Power people together with their dreamy and naïve permaculture concept. Though, I did join them in the protests against the Vietnam War and the nuclear installations in Europe. Years later, at the time I was planting the first trees on my property Parque Bambú, I got the story about permaculture right by attending a Permaculture Design Course, led by Jefferson Mecham, a friend who was applying some of the permaculture techniques with Indian families in the remote Quichua village of Chitachaka, high up in the Andes. For a long time I believed that technology was the way forward in our world, that we had to organize our daily life with the assistance of new techniques, push the green button when the red lamp flashes, that electronic circuits and the linear “if… then” logic should be able to keep processes under control. I worked in the refrigeration business, freezing 50 tons of peas and carrots to minus 30 degrees, a completely artificial techno world. Permaculture helped me see clear how alienated we are from our roots, from nature. Permaculture teaches us to follow nature. 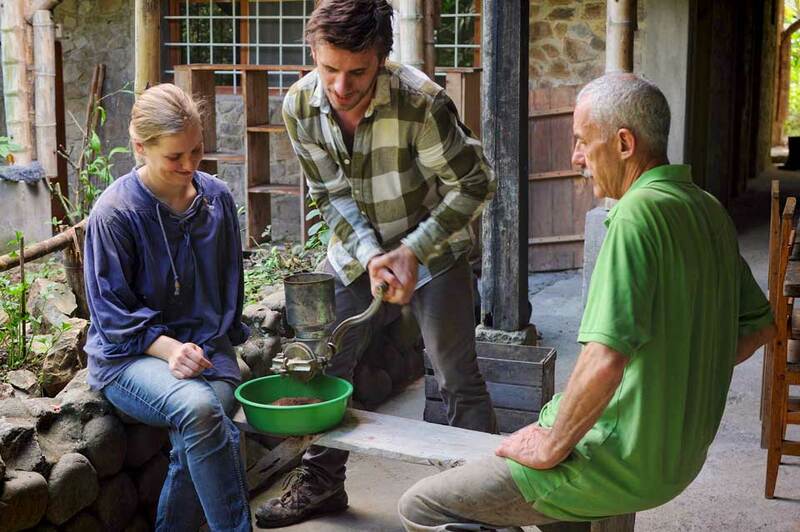 The hippie couple had indeed focused on some picturesque details, however, Permaculture is an endless journey, far beyond herb spirals or sustainability or organic farming or low energy housing, though all these are certainly part of it. 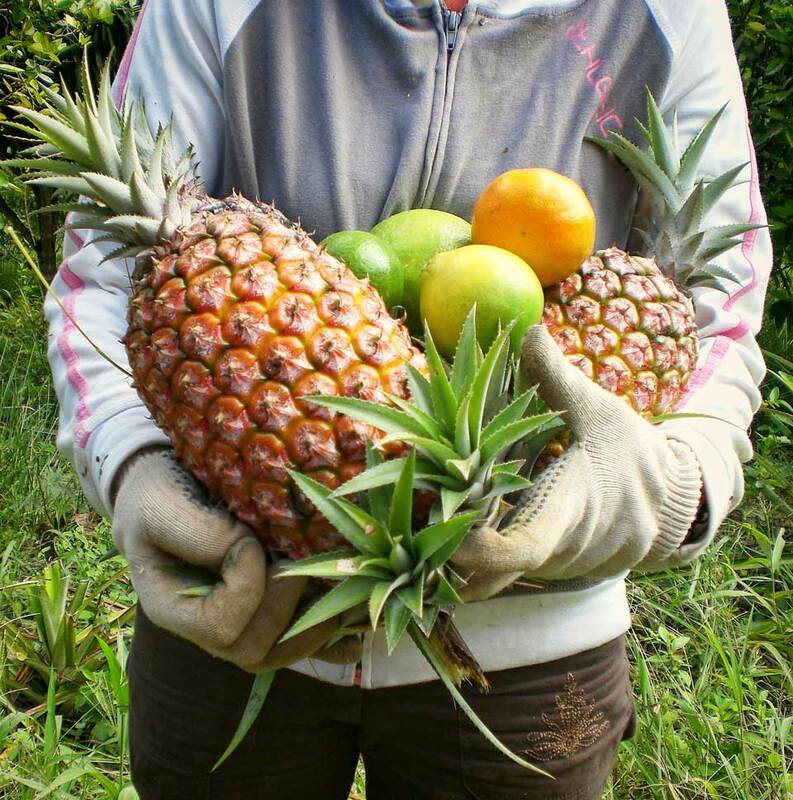 Permaculture aims to re-organize our society in a conscious, thoughtful way, not as the result of a historical development but by selecting elements not only from traditional cultures but also applying knowledge of scientific research. For example: we use mulch as a ground cover not because our ancestors have always been doing so, but because now a detailed explanation can be given how mulch, humidity, micro-organism and fungi enhance the structure of the soil. energy, and come up with simple, small and slow solutions. “Less is more” and “Small is beautiful”. I have always been fascinated by landscapes, because they tell you a lot, about their own history, about the history of the people that live in the landscape and how they treat their environment. I climbed mountains and hills, not to plant my personal flag on top but to study the valleys beneath and how people use them or… abuse them. 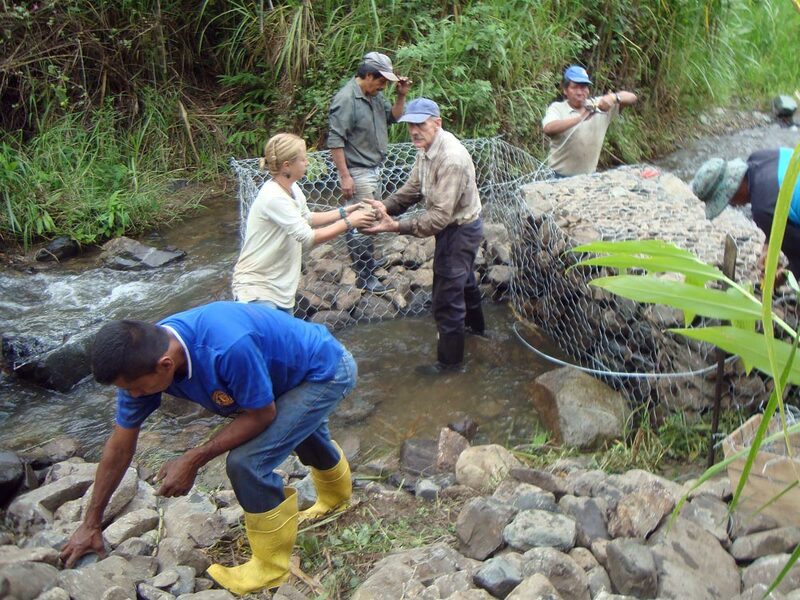 In the same fashion, a well oriented permaculture project starts with observing the specific characteristics of the location: climate, geography, type of vegetation, human history and the interaction with the environment, soil, the presence of water, steepness of the land, presence of communities or neighbors. Most businesses and corporations rest only on two legs, avoiding social and ecological responsibility. It is in the nature of capitalism to externalize all costs which are not directly linked to their profit or which are not imposed on them by the government. “Externalities” are defined as consequences of an industrial or commercial activity that affects other parties without being reflected in the price of the goods and services sold. An example: For many years Alteo Gardanne, a bauxite processing plant in southern France, has been discharging polluting red aluminum sludge into the Mediterranean Sea. By avoiding the cost of processing the waste product, the companies’ benefit is much higher and the shareholders are happy (and rich). The virtue of permaculture is exactly to take into account all the aspects of our actions and establish a Permanent Culture of Care for the Earth, Care for its People and Share Surplus. With these fundamentals in mind, a proper design can be set up. But be realistic; if you have to start from scratch, consider at least five years of hard work before you get your project running on its four legs. It took me much longer than five years, but finally Parque Bambú is running on its four legs and it is satisfying that I have been able to add to the local economy by giving jobs to local farmers, use all kind of services such as transport, the local welder, the seamstress or the occasional catering with the restaurant in the village. 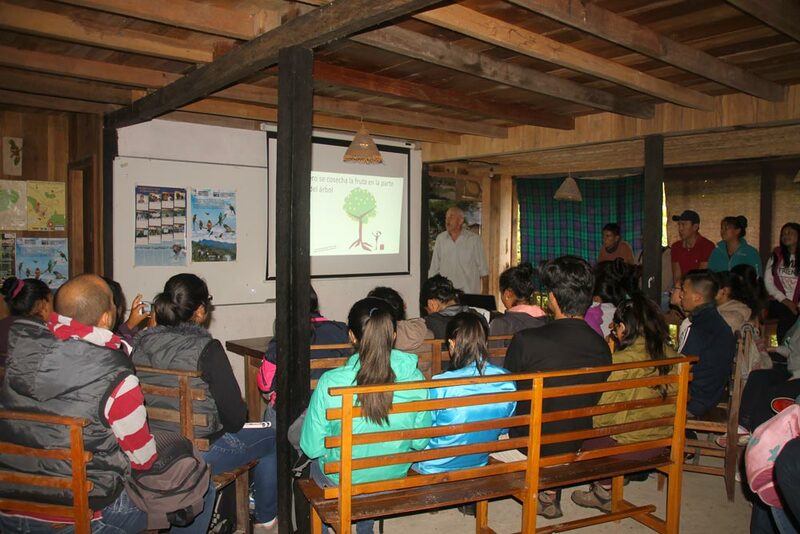 I also share my experience with visiting students and regional NGO´s and give guided tours in the property. I will not intend to further define permaculture here; I leave it to those who have a long history of teaching and writing, starting with the founders Bill Mollison and David Holmgren. Their writings and interviews, and those of so many others after them, can be found in internet, in bookstores, in specialized magazines, but most of all in the hundreds of places around the world that are applying the principles of permaculture. 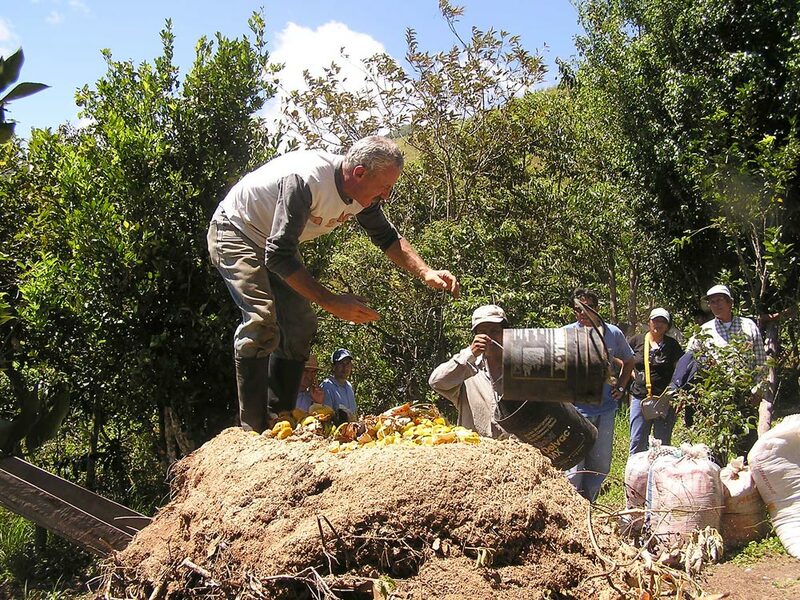 You may also find that people use other terms like Regenerative Agriculture or Natural Agriculture. I do not consider myself as a “master of permaculture” but I did learn a thing or two in the past decades. 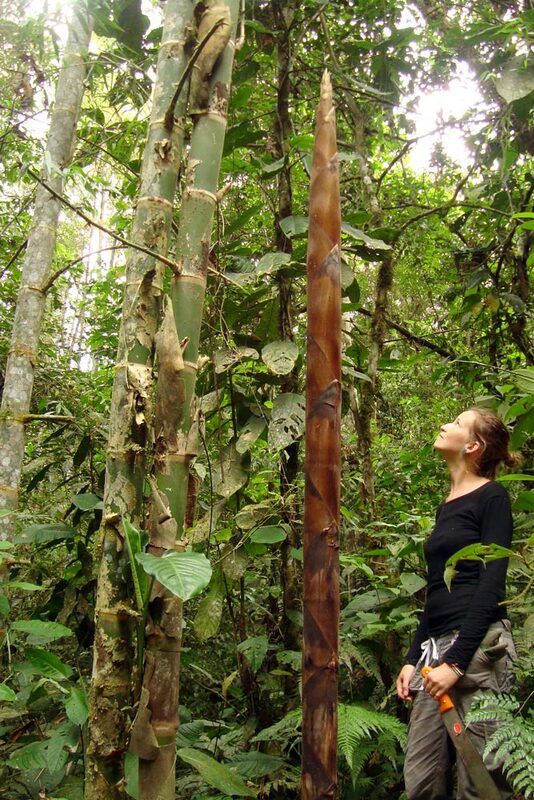 I will be glad to share my experience in Parque Bambú with you. 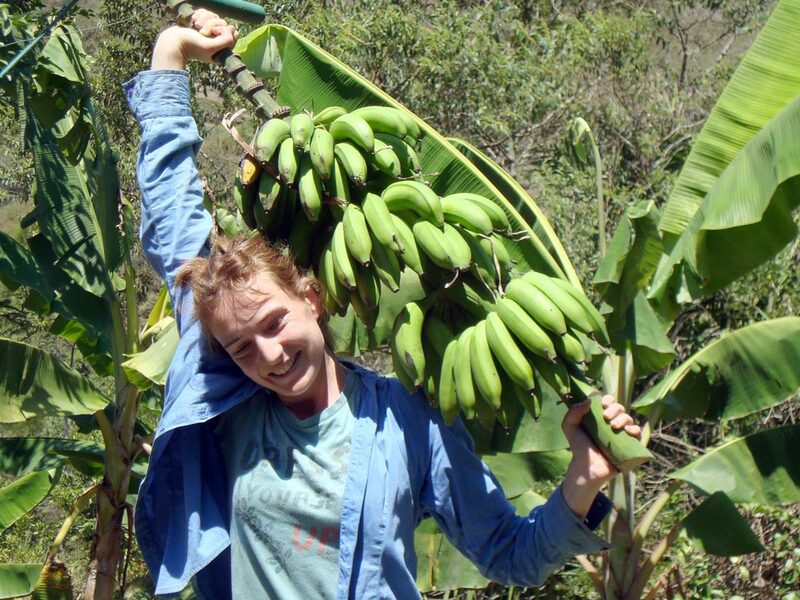 Program of apprenticeship, internship and volunteering in Parque Bambú Using the words of William Horvath (Permaculture Apprentice), one of the best ways to learn about permaculture (regenerative agriculture, agro-ecology, etc.) 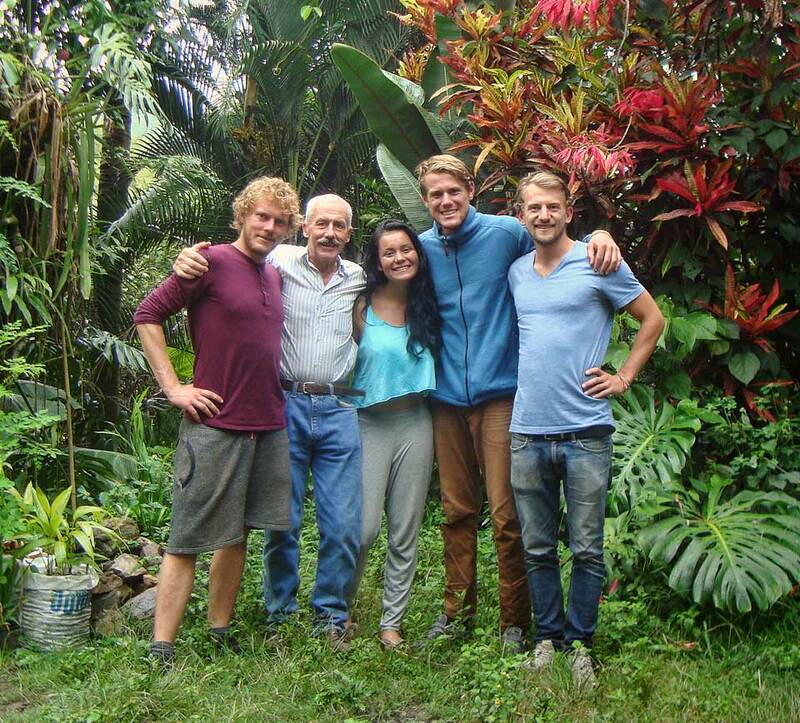 is by engaging in one of the many permaculture projects in the world, as an apprentice , in an internship or as a volunteer. 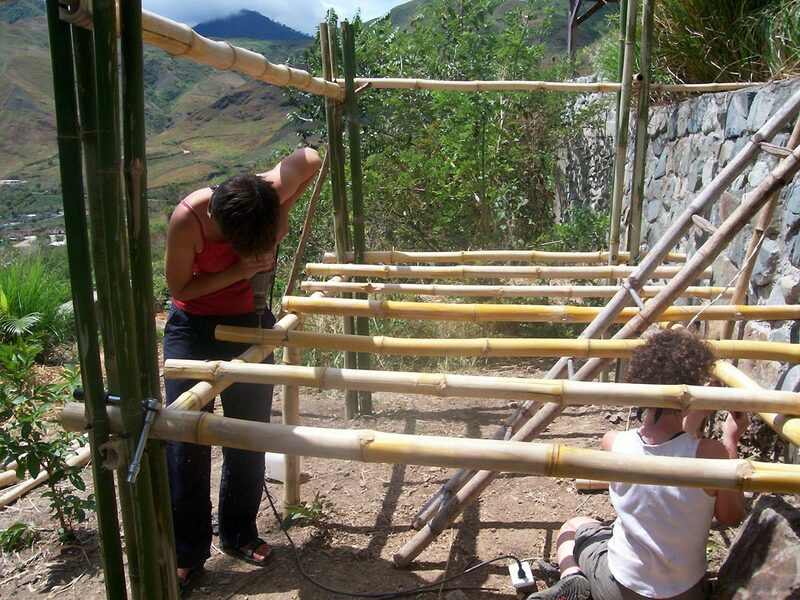 Take into account that learning permaculture is a process that takes time, and the best way is … while working. • An introduction to Permaculture for one week, alternating practical work with theoretical instructions. • A one-month course, on very specific topics to coordinate with the interested parties. • Space for internship, preferably in coordination with your training center, institute or university. • Volunteering for a minimum of three months. The price is per person. 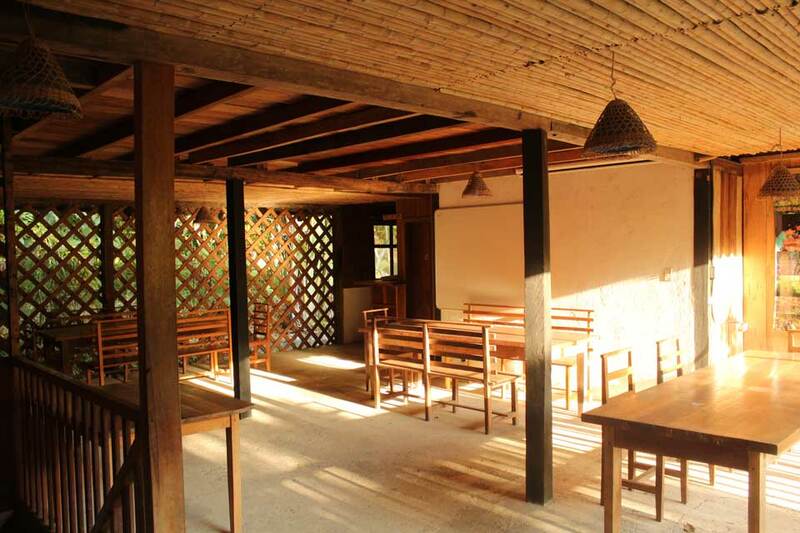 Includes: food, lodging and permaculture instruction, during daily tasks. Payment is made at the beginning of the stay. Contact us in case you want to carry out specific studies or research related to your training center, institute or university. We recommend bringing working gloves, working clothes (long trousers and long sleeved shirt), rubber boots and a hat. Note: about the last plan (“additional month”), after having paid a whole month ($ 260 / month) and if you want to work two additional months, Parque Bambú will pay you $ 4.20 per day, with the condition of staying both whole months (payment will be made after each additional month completed in full). Three private rooms and a dormitory are available for visitors, in the style of Bed & Breakfast. 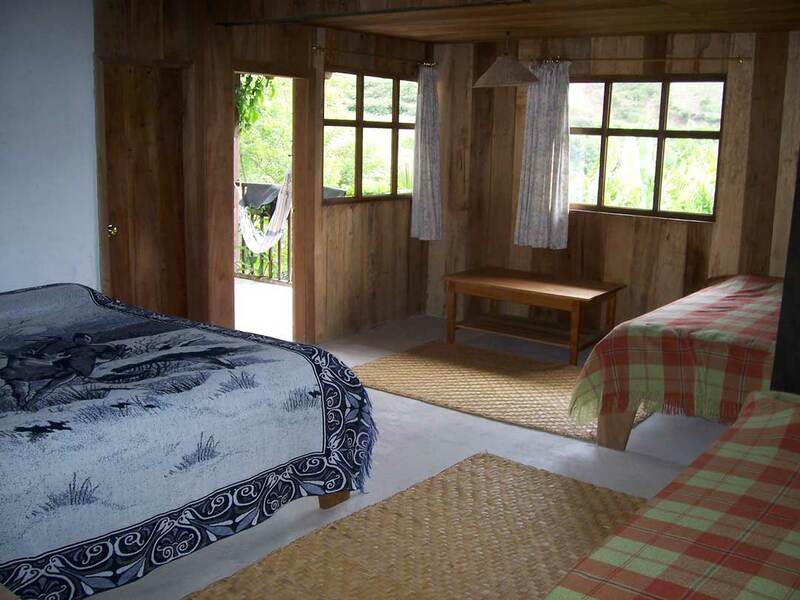 The rooms are family rooms with several beds and have a private bathroom with shower. Two of the rooms have a porch with hammock. We do not offer lunch and dinner, but the kitchen is at the disposal. 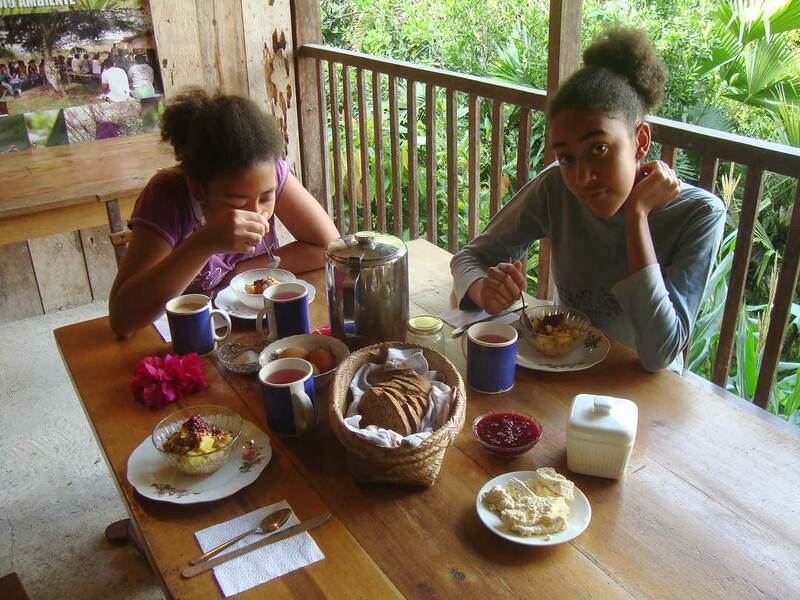 The dining room has three big tables..
A down-hill walk from “El Puerto” (2,5 hrs), the walk along the Guallupe river (2,5 hrs), the hike on the “Palo Blanco trail” (4 to 5 hrs), bringing you through a nice primary forest (for experienced hikers). 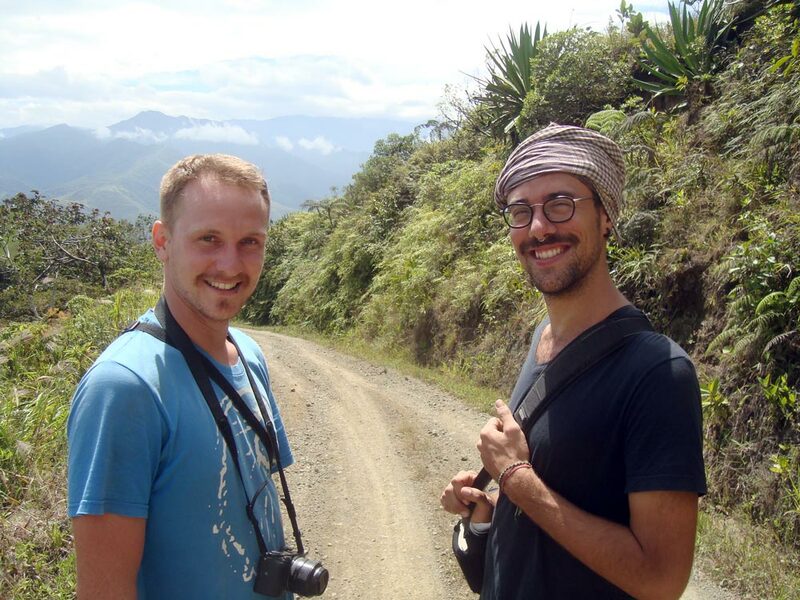 The hikes to the Highlands (Páramo) of El Angel and the remote village of Morán are organized by two knowledgeable guides: Carlos Castro and Hugo Quintanchala. Contact us for details. 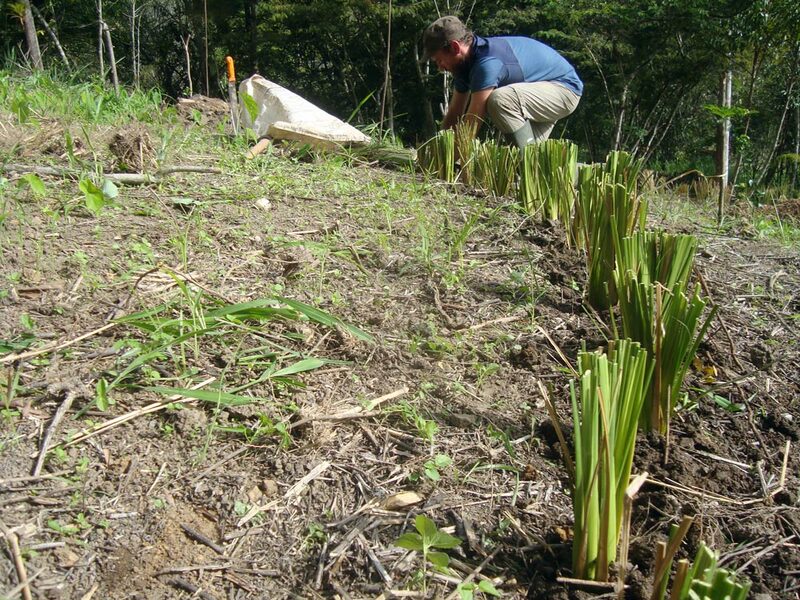 Vetiver, a perfect solution for soil restoration. Of all methods applied so far, Vetiver has proven the best tool for soil conservation, erosion control en regenerating the soil.